“For the last 15 years, I have been translating the needs of our customers to the software, service, and production departments. One area that impacts all of these is the sales department since they are the ones out there selling our product. “As a project manager, I am contacted by the salesmen, who ask how certain things can get done, what it would cost, and how available it might be. I always spend time helping when these questions come up. I make the time to figure it out. This not only helps my position, making my work easier when a project is sold, but also all other departments in the company. “It is not always just providing facts and numbers. I also take a few minutes to ask the salesmen about where in the country they are at that moment, what airport, how humid it is in the south, how cold in the north, and how soon before they get home again. “While this seems pretty routine, we recently had one of our salesmen retire that lives in Ohio. There was no going-away party, no email announcement from the President, or even a gift certificate given that I’m aware of. I thought, just as other retirements go, I wouldn’t hear or see from him again. “One week later I received a handwritten letter from him in the mail telling me how I helped make his sales job easy and his time at the company enjoyable. Most of all, he thanked me for being a good friend. I consider this to be one of the best awards I have received in recent years. “The lesson I learned from this experience is that I am always forging relationships. Of course, your organization’s goals and objectives must come first, and friendships between team members isn’t likely to be listed as one. Be assured that becoming genuinely interested in your team members is not a conflicting goal. Far from it! When you show genuine interest (Leadership Principle #2), you strengthen your team and maximize their ability to reach your organization’s objectives and goals. Team members who feel a lack of connection become disengaged. Valued team members engage and get the job done right. Do everything you can to show genuine interest in your team members. Start by asking questions and actively listening. 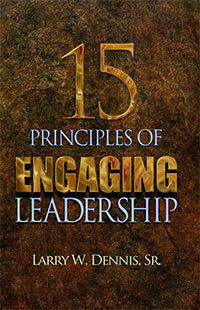 You will engage your team and know the joy of true leadership and friendship.